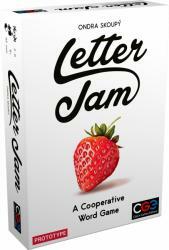 Vocabulary and deduction are called for in Czech Games Edition’s new title Letter Jam, releasing this summer. 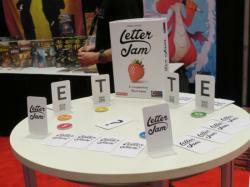 In Letter Jam, the players hold cards showing letters so that only the other players can see them. They take turns forming words using the letters they can see, giving hints to the others about which cards are hidden from them. In the end, they try to name the word hidden in their own cards, and the group scores based on how many players can complete the challenge. The game was created by Ondra Skoupy of Czech Games Edition, and is intended for 2 to 6 players, ages 8 and up. Letter Jam takes about 45 minutes to play.